After a long break from live music and an even longer break from blogging we're getting back into the groove this week with both. 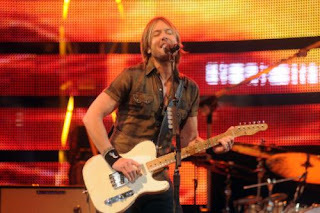 We were invited by our friends Kelly and Lanie at Ryan Co. in Houston to come down to the Houston Rodeo so we picked the night Keith Urban was playing. The Houston Rodeo has a lineup of the who's who of country music and even though you know it's not my preferred music I was looking forward to the great guitar work Keith is known for. We were able to bring Brittany and her boyfriend Derek along as well so it was a real family outing. We hit the food tent before hand and every BBQ place in Houston was represented. After a nice plate of chicken it was off to my first rodeo. This is the biggest rodeo around as it's held at Reliant Stadium - the home of the NFL Texans. We got into the arena around 7 PM and saw some bull riding, steer wrestling and the ever popular "mutton busting" which entails 5 and 6 year olds holding on for dear life to a sheep as it runs across the arena! Once the rodeo portion is wrapping up a portable stage is moved into the middle of the stadium and right about 9 PM Keith took the stage. The stage spins so that everyone can see and I will have to say the sound was excellent. He opened with "Put you in a song" which is the opener off of his newest release. It's a catchy song but I really struggle on how he is classified as country music. The main topics of a pickup truck, a dog, an ex-wife and a bunch of drinking are not really contained in his songs. I think it's really pop music and is far closer to a rock and roll show than a country show to me. The best sing along of the night came during "Deep in the Heart of Texas" as it seemed like most of the crowd of 50K didn't really know the words to his own songs. He also did a few bars from Cheap Trick's "I want you to want me" as well as "Always on my mind." The setup was challenging as the stage was in the middle of the floor but no fans nearby. Urban addressed this by leaving the stage and running over to high five fans! There was a lot of excellent guitar work as hoped for. He would be an excellent rock and roll guitarist with lots of solos and some great work on both electric and acoustic guitars. He played a 60 minuite set that was high energy and very entertaining. Overall, just the right length for country music for me. Up next - SXSW starts this weekend - the RSVP's are all complete and I'm even getting a wristband this year for the night time showcases. Just got to get rested up and prepared for the onslaught of the craziness!